Some places you visit and some places you experience, but staying at Cave Springs Resort you’ll make history and memories of a lifetime. We did. Since the 1920’s, weary travelers have rested their tired bodies at this magical spot situated right on the Sacramento River in Dunsmuir, California at the bottom of majestic Mount Shasta. A lot has evolved since those beginning days before Interstate 5 was built. But in many ways, not much has changed at all, as Cave Springs still creates a haven for couples to bond, relax, and enjoy the best the Shasta area has to offer. Things like fly fishing and horseback riding in the spring and summer, ice fishing in the winter, skiing, snow mobiling, shopping, ice skating, hiking, snow shoeing, cross country, jet skiing, and exploring are still favorites. Cave Springs offers accommodation choices ranging from tiny modest cabins overlooking the river, to fully furnished manufactured home rentals. Many of the cabins include extras like full kitchens, multiple bedrooms and bathrooms, and even a Jacuzzi and view looking out at the awe-inspiring mountain and raging river. Best of all, Cave Springs is central to all the fun. It’s the perfect hub from which to experience it all. On our arrival day we were a bit early and had plans to snowmobile just north of Shasta at Deer Mountain Snow Mobile Park. When we arrived, our rental home was almost ready but we were kindly offered another unit to use for changing into our snow mobiling garb. A quick drive north and we embarked on our first adventure. We donned helmets and underwent the safety briefing and then we were off on the most gorgeous winter wonderland trek exploring breathtaking vistas and outlooks throughout the Klamath national forestlands. We were accompanied by our gracious and knowledgeable guide, long time resident and outdoor enthusiast Michele Valdez. Neither of us will ever forget the memory of trekking through the pristine wilderness on gorgeous groomed trails and off the beaten path, enjoying the vast outdoors, enveloped in a blanket of white. Michele was the perfect hostess, stopping us to offer bits of history and fact as we soared like eagles over the pristine hills, powdered mountains, and snowy meadows. With patience and gentleness, she made us feel right at home. The snowmobiles and safety gear only enhanced the experience for everyone. Michele has won safety awards through the California Nevada Snowmobile Association and countless visitors are amazed at what an unforgettable experience she makes. After an unforgettable afternoon, we enjoyed a delicious steak dinner at the Black Bear Diner in Shasta City. The food was of great quality and enormous portions as it always is in Black Bear Diners throughout California. With some adorable souvenirs purchased in the gift shop, we were ready to retreat back to our little home away from home at Cave Springs where the 24 hour-a-day Jacuzzi felt great on our exercised muscles. After a restful night’s sleep on comfortable beds followed by a leisurely steak and eggs breakfast we whipped up in our full kitchen, we were ready to explore the historic and charming towns of both Dunsmuir and Shasta City. We spent hours browsing gift shops and eclectic bookstores. We then headed up the gorgeous mountain of Shasta to the Bunny Flat Recreation Area. At the bottom of the mountain, we stopped to enjoy the headwaters of the Sacramento River where it all begins with the purest crystal mountain water coming right out of Shasta. There’s a great park and museum there. In both the towns of Shasta and Dunsmuir one would be surprised how many gorgeous parks, botanical gardens, fish hatcheries, waterfalls and points of historical interest wait to entice, educate, and entertain all within just minutes of Cave Springs resort. There’s so much to do, or not do. Talk about friendly, the small town atmosphere of both towns makes me yearn for the days when growing up was so sweet and simple in so many small California towns. A short stop to visit Hedge Creek Falls proved fascinating also. It’s just one of many hidden and little-known gems of the area. Later, we hiked along the river and explored Cave Springs. We loved climbing into the cave, dripping with the natural soda water that gave the place its name. The train occasionally rolled by, adding to the ambiance. Back at our rental, we enjoyed movies, games, and a delicious dinner together. On our final day, we arose to try our hand at ice fishing just outside Shasta at Castle Lake. A short drive north, and a beautiful hike over a knoll in the snow, revealed a breathtaking taste of wilderness as we walked out onto a serenely peaceful frozen Castle Lake. Rods and bait in hand, we began dropping our line in a few of the small ice fishing holes drilled by locals into the deep snow and ice. Within minutes the fish were biting and we caught our first German Brown trout with several Rainbows to follow. On the sheer mountains surrounding Castle Lake, an occasional cross country skier or snowshoer waved hello and inquired as to our luck. Trout in hand, we romped through the snow back to our vehicle, a bit tired but ecstatic from our morning fishing. Although we only had a few days away, we felt surprisingly refreshed and invigorated from our little Shasta area getaway. All the fresh air and sunshine had something to do with it, I’m sure. Sad to leave, at least we could look forward to going back in the late spring and enjoying the other wonderful recreational activities the area offers like hot air ballooning, fly fishing, dinner train ride, and hiking. 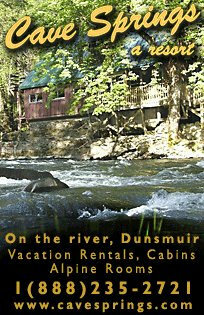 If you like adventure, fishing, history, and enjoying life at a leisurely pace, or any combination thereof, then Dunsmuir is your next must-visit destination. It’s the kind of place where you’ll make priceless memories, bond, and come back renewed and planning your next visit. 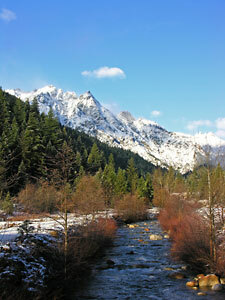 Visit before the snow and ice melts so you can enjoy the best winter and early spring fun around.